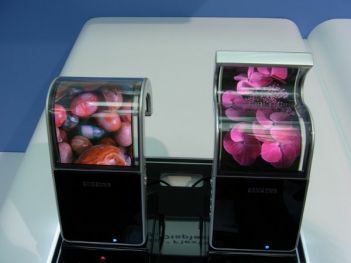 ETNews reports that Samsung decided to postpone its flexible OLED production to 2013, and will use those pilot lines to produce regular glass-based OLEDs. Samsung has to delay flexible OLEDs because of technical issues (low uniformity and slow encapsulation) - but also because they need more OLED capacity because of high demand for larger AMOLED displays. Samsung Display can currently produce 56,000 5.5-Gen (1300x1500 mmm) glass substrates a month. The pilot lines used for flexible OLED development can produce 8,000 more substrates monthly, bringing the total to 64,000. Samsung may also go ahead and re-fit their planned A2 lines from plastic OLEDs to glass ones, which will increase the capacity by a further 32,000 monthly substrates, but will push back plastic-based OLED production. If they'll do so, their glass-based OLED capacity will grow to 96,000 monthly substrates. Samsung will then start working on a new factory (A3) which will be used for flexible OLEDs.